The day after the concert I went to with Olive Picker, her and I were supposed to try our hand at canning. a) forgot the canning supplies. All of it. You see, the day of the concert I had to work, after work I was to drive to O.P. & MommaBean's house to pick O.P. so we could go directly to the concert. I forgot to put everything in my car. Except my overnight bag. b) took NO cash to the farmers market. That's right, we had about $7 between us which we used to buy a soda and a Flint Farmers Market shopping bag. And on a side note, the farmers market is Flint is awesome. And I don't like Flint. Woefully unprepared is what we were. MommaBean came to the rescue for me this week. She went and bought me a bushel of tomatoes and invited to show O.P. and I how to can stewed tomatoes and spaghetti sauce. Did you know that an astonishing amount of tomatoes make a surprisingly small amount of goods? 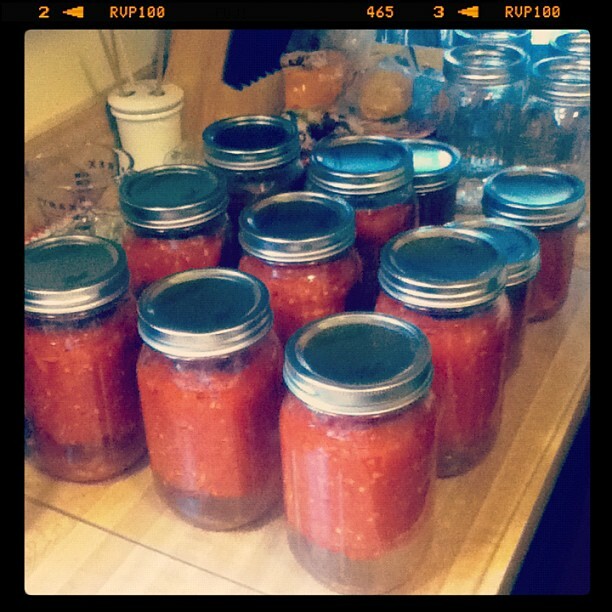 I have just enough (six) tomatoes left over to make 3 pints of salsa. I'm going to attempt it on my own this week. Results to follow. Please pray for me if you will.